But the crazy winds that have been buffeting Newfoundland so much this January weren’t going to make it easy! Strong gusts of about 120km/h blew up overnight and throughout Thursday, cancelling many flights and delaying his arrival by more than 24 hours. Despite spending far too much time in airports and not seeing his hotel until the wee hours of the night, Peter was rearing to go when I picked him up Friday morning. The winds were still blowing hard & cold when we arrived at Cape Spear twenty minutes later, biting at us as we headed out to the tip. And they weren’t done wreaking havoc on our plans just yet! The strong offshore winds of the past few days had apparently moved all the Dovekie well away from land … we couldn’t find a single one in our 2-3 hours of scanning the waters both near and far. Black Guillemots bobbed around the point, Common Eider and Long-tailed Ducks loafed further out, and Great Cormorants drifted by every few minutes. But no bullbirds!! Concerns started to gnaw away at my confidence … knowing that Dovekie often head back out to sea and become difficult to find by early February, I wondered if these winds might have spelt an early end to their gracing of our shores this year?!?! After taking a short break to check for the elusive Yellow-legged Gull at various places around the city (it has not been reported in over a month), we headed north to check other coves and harbours for Dovekie – Flatrock, Torbay and Outer Cove. No such luck! Common Loons, Red-breasted Mergansers, Greater Scaup, and even a Red-necked Grebe were present and accounted for – but no bullbirds. And so ended our first (frustrating) day. 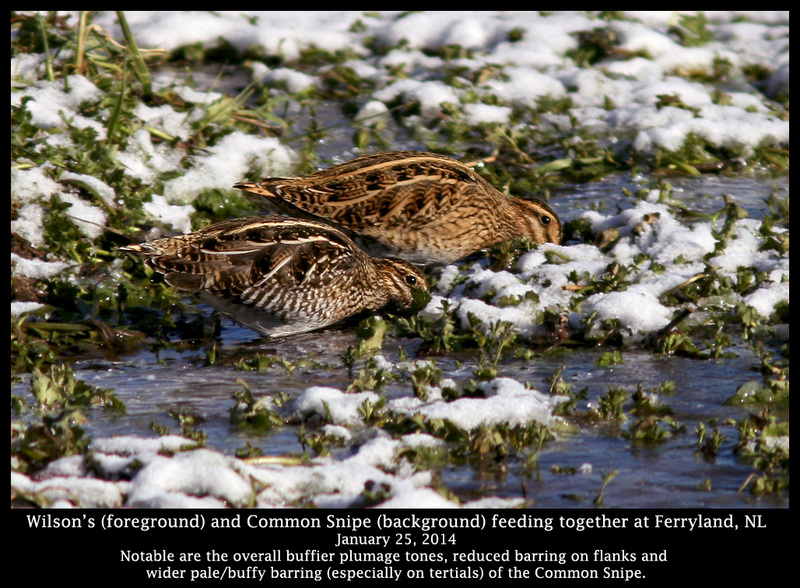 This COMMON SNIPE at Ferryland marks the third record of this European species for the province and all of eastern North America! With most of Saturday to go birding before his flight back to Toronto, Peter and I headed out at first light – straight to Ferryland to look for the COMMON SNIPE that has been hanging out there. 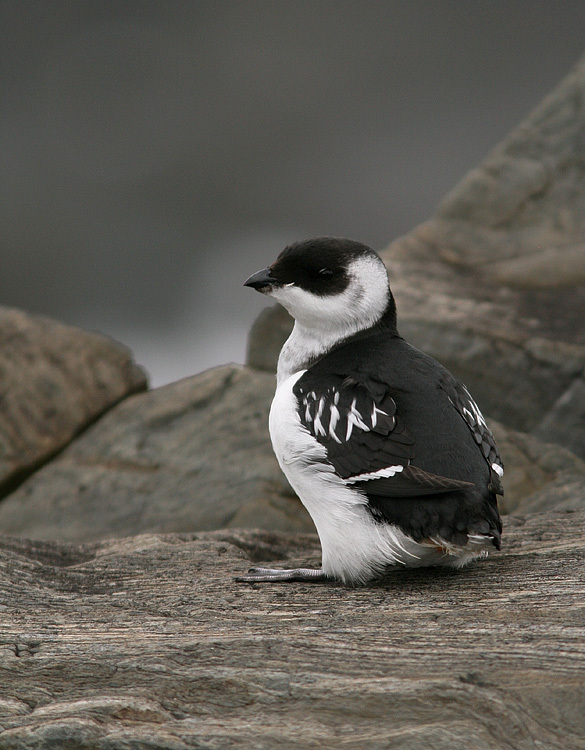 This species is extremely rare anywhere but the westernmost reaches of Alaska, with this one being just the third record for all of North America away from the Pacific coast (all of which have occurred in this province!). 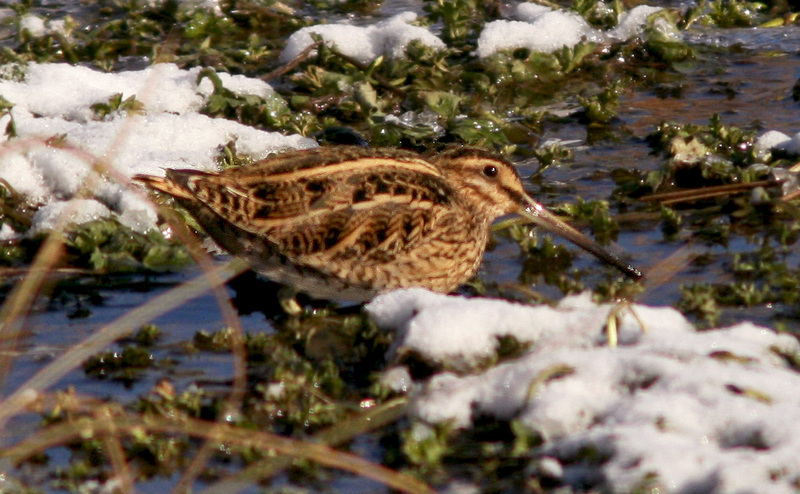 Since we came up empty-handed at several stops to look for Dovekie on the drive south, I was happy to find the Snipe (along with two of its North American cousin, Wilson’s Snipe) at the usual location, allowing good views as it huddled in the mud & snow. Next, we headed further south to Bear Cove … hoping that at least one Dovekie had held strong and stayed for our viewing pleasure. Sure enough, we found one (and just one!) feeding about 100 metres offshore. It toyed with us for the first few minutes, coming up for air only momentarily before diving again – but then we were able to enjoy great looks through the scope as it sat on the surface, toying instead with a fish it had just caught. We looked for more as we headed back toward the city, finding none!! 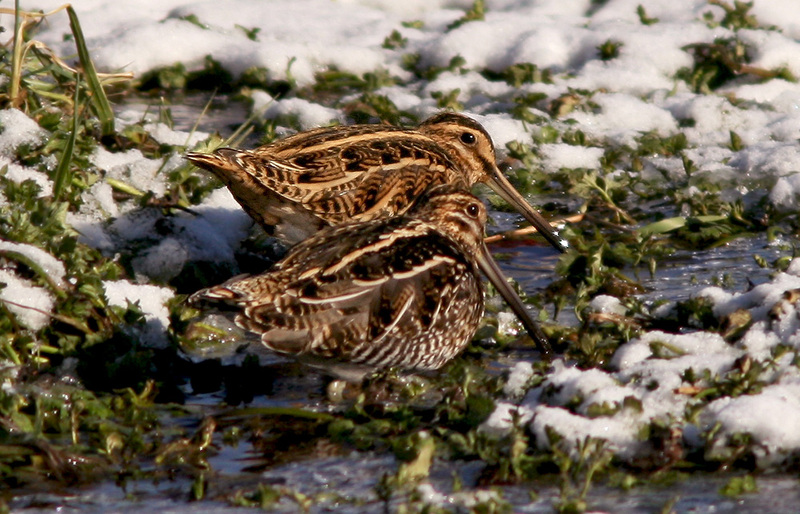 We did, however, enjoy even better views of the Common Snipe! This entry was posted in Uncategorized and tagged Common Snipe, Dovekie, Gallinago gallinago, Newfoundland, rare bird, Tours, winter bird list. Bookmark the permalink. Ridiculous comparison shots… just awesome!